The pronounced orange flavour in this cocktail makes for a refreshing summertime drink. To make the thyme simple syrup: In a saucepan over medium heat combine 2 cups (500 ml) water and 1 cup (250 ml) sugar. Stir occasionally until sugar is dissolved. Remove from heat and add thyme, covering pot to steep. Let cool and remove thyme. Combine the orange juice, gin, vermouth, Campari, simple syrup, and lemon juice in a shaker filled with ice. Strain into a rocks glass. 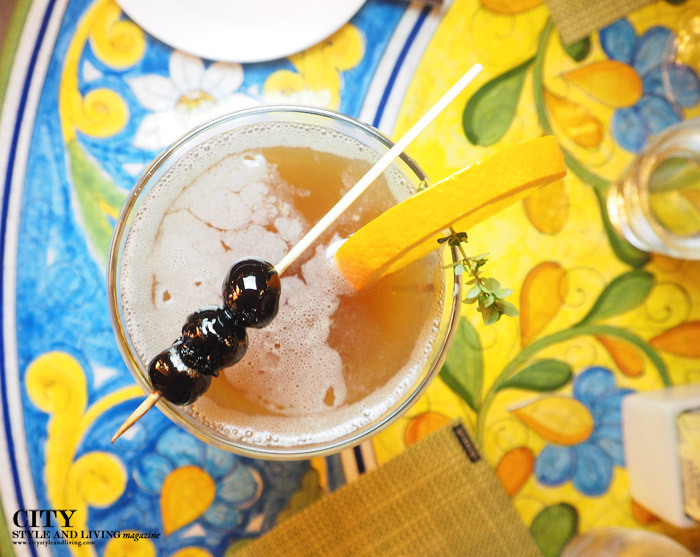 Add a slice of orange and place three Luxardo cherries on a skewer to garnish. Luxardo Cherries: The original maraschino cherry is nothing like the imitators. Quickly burning an orange rind releases essential oils. Want more food? This original article first appeared in the Summer 2016 issue of City Style and Living Magazine.